The first bridge over the tracks at High Street was built in 1906. 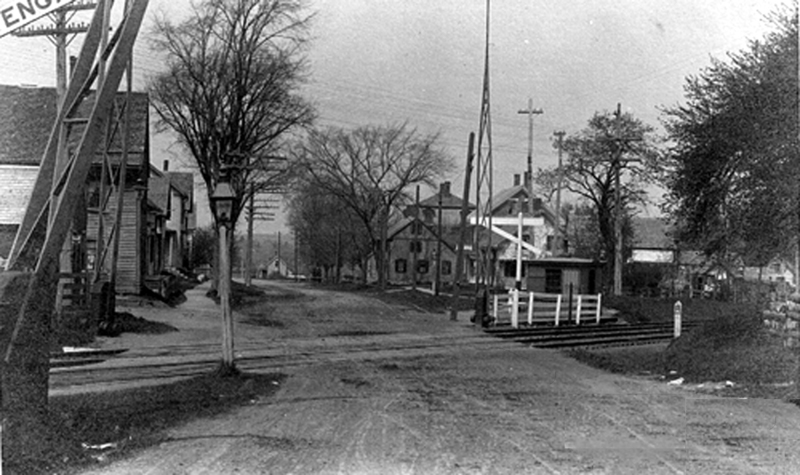 High Street originally continued straight at the John Kimball Jr. house (the one with the blue tree house) until the first bridge over the railroad tracks was constructed in 1906. 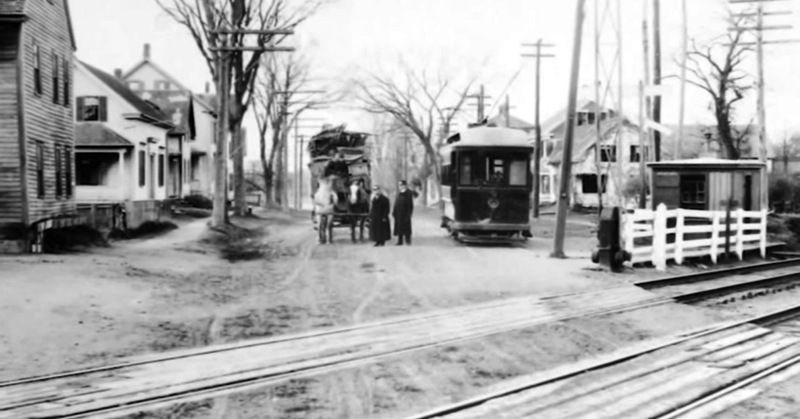 From 1900 when the first trolleys came to town until the bridge was built, passengers had to unload here to switch from the trolley from Newburyport to continue through Ipswich. Shown below is an old photo of High Street before the first bridge was built across the tracks. High Street crossed the tracks at grade and continued straight on what is now a dead end section of old High Street ending at Kimball Avenue. 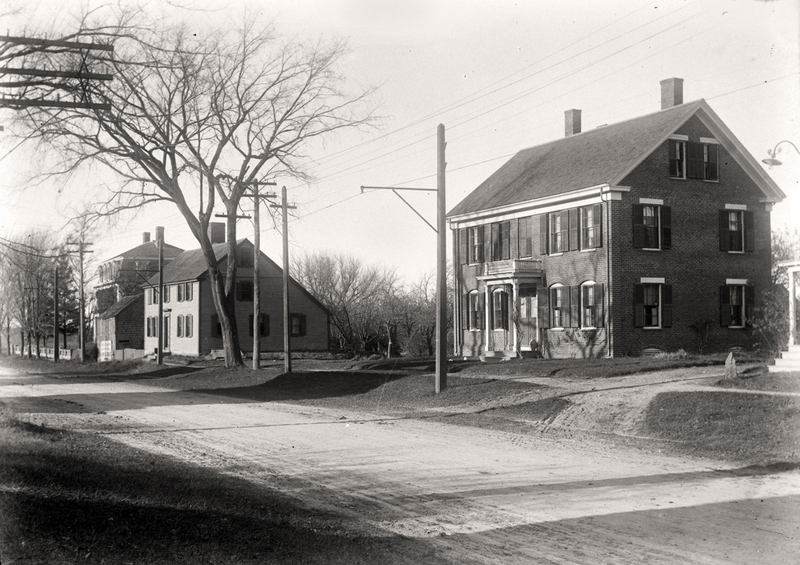 The driveway for the John Kimball Jr. house, built in 1730 is actually the old High Street. 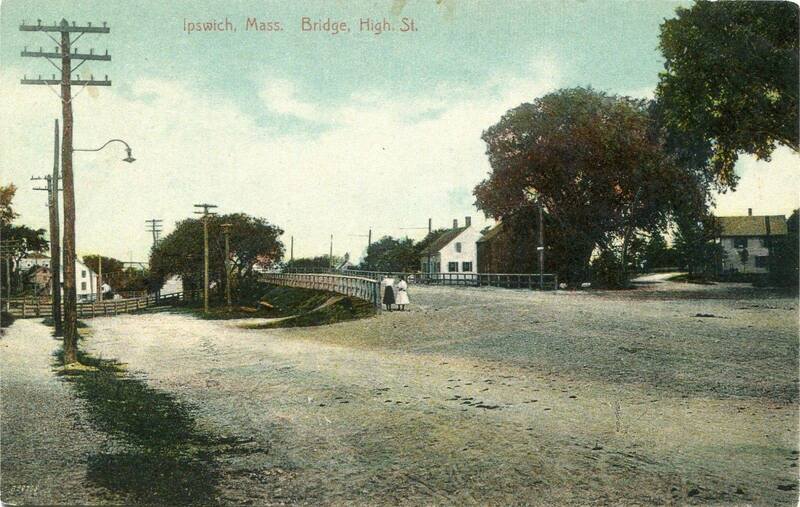 When the first bridge was built crossing the tracks on High Street in 1906 the roadway was moved a bit to the east. 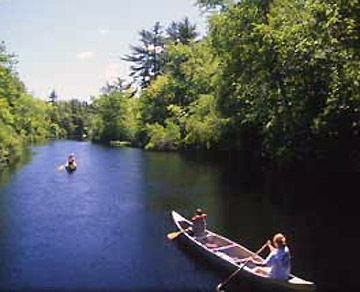 The newly rebuilt bridge is in that same location. This photograph was taken by George Dexter before the bridge was built. The house in the foreground was removed to build the bridge. It’s remarkable similarity to the Joseph King House,still standing on the west side of the street north of the bridge, suggests that it may have been moved to that location. The next house is Baker Sutton Antiques, still standing. Beyond it is Brown’s Manner, also still standing. William J. Barton wrote the following about this photo in 1963: “Upper High Street before the bridge was built over the Boston and Maine RR. The house on the left was the George Harris house, now owned by Lydia Harris.The barn, and then the old house; part belonged to Jennie Butler. The house across the track was Nat Burnham’s house, moved to Locust St. The house facing was on the corner of High and Town Farm Road, now on Locust St., and the front faces High under the bank of the road over the RR bridge. Edward L. Darling picture.